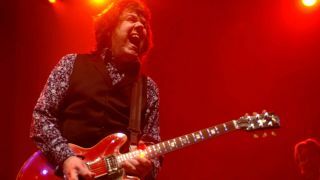 Following his departure from Skid Row, the guitarist formed The Gary Moore Band and recorded his first solo record, Grinding Stone - a slightly bizarre melting pot of blues, jazz, fusion and funk. Although it featured some great guitar work, the album failed to make an impact commercially. Moore was asked to join Thin Lizzy for the first time in early 1974, following the departure of guitarist and founding member Eric Bell. Although Moore only managed a few months with Lizzy, he recorded the lead guitar for Still In Love With You, which would appear on the band's fourth studio album Nightlife. Later on in 1974 Moore would meet and form a band with drummer Jon Hiseman of 60s jazz rockers Colosseum who wished to resurrect the moniker and the band's improvisational style. The group released two albums, Strange Flesh (featuring Inquisition) in 1976 and Electric Savage in 1977. Come 1978, Moore was ready to rejoin Thin Lizzy and he would go on to help write and record the band's most successful studio album Black Rose: A Rock Legend, which was released in 1979. The album's title track, in particular, features some incredible playing and guitar arrangements, combining four traditional songs into one seven-minute spectacular. Hot on the heels of his fertile period with Thin Lizzy, Moore released his second solo album, 1979's 'Back On The Streets', which included his breakthrough hit, Parisienne Walkways, the result of another collaboration with Phil Lynott. Has there ever been a better advert for a Les Paul's incredible sustain? By 1982, perhaps influenced by his stints in Thin Lizzy, Moore was heading in a hard rock direction and his third solo album Corridors Of Power featured a much heavier, metal-tinged playing style, as evidenced by End Of The World. Having released a string of albums in the hard rock vein, Moore's sixth solo effort, 'Run For Cover', was a victory lap of sorts and featured a string of collaborators including Phil Lynott (who featured on the record's most successful single Out In The Fields), Glenn Hughes (Deep Purple) and Paul Thompson (Roxy Music). 1987 saw the release of another solo album, 'Wild Frontier', which featured another Top 20 hit, 'Over The Hills And Far Away'. Moore dedicated the album to his friend and long-time collaborator Phil Lynott, who had sadly passed away the year before. Come 1990, Moore decided to return and explore the blues guitar work that had so influenced him in his early years, the result was 'Still Got The Blues'. The album also featured an impressive line-up of guest stars including George Harrison and blues greats Albert King and Albert Collins. Having found his home in blues-rock, Moore would go on to play with many of his heroes throughout the next 20 years of his career. In this video the (clearly thrilled) guitarist jams with BB King on a version of 'Since I Met You Baby', featuring some phenomenal duelling guitar work from both players.